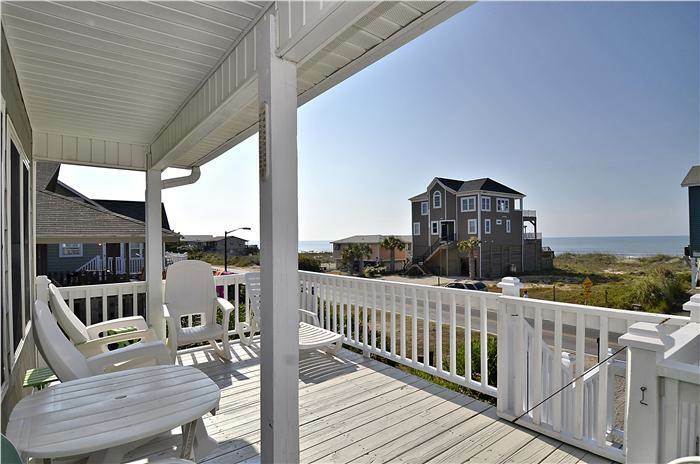 Enjoy beautiful views of the ocean from this 4 bedrooms, 4 bath DOG FRIENDLY home with new private pool and hot tub. Amenities include 4 flat screen TVs, whole-house DVR, 2 DVD players, Wireless Internet Access. A fully equipped kitchen includes Dishwasher, Washer/Dryer, Microwave and plenty of seating to accommodate your family meals. Central Heating & Air with Ceiling Fans (living room and bedrooms), enclosed Hot/Cold Shower, Sundeck with furniture. Sleeps 8 with plenty of room to spread out. Bedding: Downstairs: King. Upstairs: King, Queen, Queen. No Smoking. Very clean, updated with ample seating and incredible views! Great front porch for morning coffee. Open floor plan in front of house so you can see the ocean from the LR, KIT & DR. The bedrooms are soothing with comfortable beds - I can't find anything to complain about! Hoping to stay here for many years to come.